Why do I need a game asset database? The Content Browser uses a special database backend for storing assets, tags and collections. 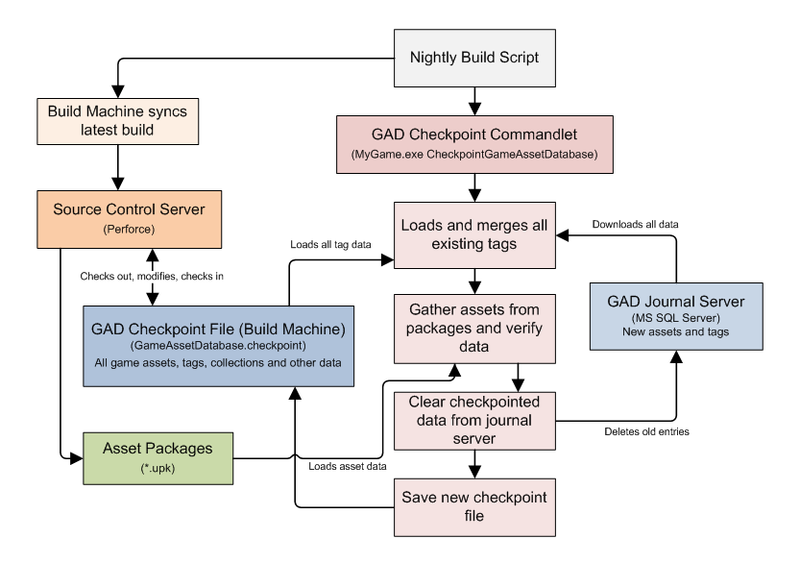 We call this system the Game Asset Database (or GAD for short), but it's really a mixture of several database components: A journal server, a checkpoint file, thumbnail storage and an in-memory database. There is also a checkpoint commandlet that is used to update and maintain the database. All of this is pretty much transparent to a user working in the Content Browser -- but it adds some nice features. All game content is instantly available for browsing, whether it's loaded or not. Users never have to check out packages to tag assets or add them to collections. Thumbnails are displayed for all game assets, even assets that aren't loaded. In the editor, most common interactions with non-loaded assets are supported. The editor will simply load the asset on demand before the action is executed. For example, if the user drags and drops an unloaded static mesh into the 3D viewport the Content Browser will automatically load the mesh before placing it. When the editor starts up it first loads all asset names, tags and collections from a read-only checkpoint file. This file represents the state of all tags in the game at the time the last checkpoint process was run (at least once per day.) Next the editor connects to the journal server and downloads any recently-applied tags. The Content Browser now knows about all assets, packages, groups, tags and collections in the entire game. The user can browse all game assets (loaded or not) using the graphical interface. Thumbnails for loaded assets will be generated dynamically, but thumbnails for non-loaded assets will be quickly loaded straight from their asset package files. When the user decides to tag an asset, the Content Browser updates it's in-memory database with the change, then immediately connects to the journal server and uploads the tag command. Note that the checkpoint file is never modified by the Editor -- all changes are routed to the journal server and resolved later on during by the checkpoint commandlet. The following chart shows how the Content Browser interacts with the game asset database. Additionally, it's possible to run the editor in "Offline Mode" which allows for limited functionality without using a live server. See the section near this bottom of this page about "Offline Mode" for more information about that. 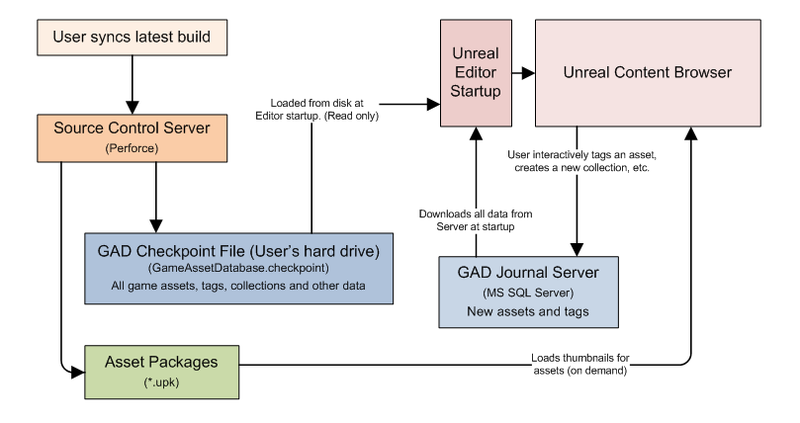 The following chart shows how a script running on a build machine generates and maintains asset database data. It seems complicated at first but it's actually very straightforward and easy to maintain. Run a commandlet to create a new Checkpoint file for your game. Install and configure the journal server. Set the database/branch settings in each game's editor configuration file. Users won't be able to browse the entirety of the game's content. Only loaded assets will be searchable and interactive. The experience will be similar to that of the Generic Browser, except you'll still see all packages and directories. It's pretty easy and fast to create a checkpoint file, even locally, so you shouldn't have to resort to that. No way you'd want to give up all those goodies, right? Totally worth the effort! Read on to learn about how to get up and running. First you'll need to create a initial checkpoint file for each of your games. Games have a single GAD checkpoint file stored as /MyGame/Content/GameAssetDatabase.checkpoint. This is a binary file that stores meta data for all assets in the entire game (including all engine assets.) The editor will load the checkpoint file into memory at startup where it will be used by the Content Browser to locate assets quickly. That's it! You now have a working checkpoint file for this game. If you load up the editor you'll now be able to browse all assets in the game using the Content Browser. Normally, you should check this file into source control. You can read more about that in the next section. The checkpoint commandlet doesn't usually need any extra parameters, but there are some options you may use from time to time. See the section below for more info. Syncs to the last successful engine build (including binaries). Often, the last good build had just completed immediately prior. Syncs all game content (and only game content) to the head revision. This is so that the asset checkpoint will be as up-to-date as possible, even if we're running a slightly older build of the engine. Executes the checkpoint commandlet to update the checkpoint file. The commandlet's output is checked for error text by the build system engine. If something went wrong, the checkpoint fails and the file is reverted, and emails are sent to appropriate folks. This involves installing a SQL server and configuring it so your developers can read and write to it. The Content Browser demands on SQL are extremely light so we recommend using the free 'Express Edition' of Microsoft SQL Server, but if you're already using the full version of MS SQL that will work great, too. Remember, the server is only used as a scratchpad for newly-tagged assets and usually contains no more than a few thousand rows at any point in time. Most of the actual GAD data is stored in a 'Checkpoint File' on disk. Note: If your team has no need for asset tags, collections and certain types of asset meta data (e.g. Date Added), you could skip the Journal server setup and rebuild the checkpoint file from scratch whenever you want to freshen your asset database. It's up to you. The installer may warn you about some prerequisites that must be installed first (e.g. Windows Installer, Windows Powershell.) Go ahead and install those first if prompted. For MS SQL Server Express 2008, you can use the default installation settings the entire way through. If your using a different version of the application, make sure that MS SQL Server Management Studio is installed along with the server so you can easily edit/audit settings. If prompted for a Server Admin name you can you your own user name, or check with your IT department for what to use there. You can name the database whatever you'd like, just take note of it because we'll need that name later on when configuring Unreal Editor. Use the sqlcmd.exe command-line application to execute this script. If everything goes well you won't see any error messages, and your journal server is ready to rock! Note: Normal Windows authentication should be enabled by default on your new server, but you may need to talk to your IT department to make sure everything is configured such that your team member's computers can communicate with it directly. If for some reason you need to create the server instance manually, follow the steps in the next section. You only need to follow these steps in the unlikely case that the CreateContentJournal.sql script didn't work for you. If you ran the script successfully, the database is already created and you can skip this entire section! Load up MS SQL Server Management Studio and connect to your database. In the Object Explorer on the left, right click no "Databases" and click "New Database...". The "New Database" dialog window will pop up. Click "OK" to close the dialog and save the new database. Under "ContentJournal" in the Object Explorer, right click on "Tables" and click "New Table...". The table designer will open up in the content area of the application. Right click on the first column ("DatabaseIndex") and click "Set Primary Key"
Press Ctrl+S to save the new table. The save dialog will pop up. Great! The journal server is now alive and kicking. After the journal server is setup, you'll need to tell UnrealEd where to find it. Also you need to set the "branch name" for the particular source control branch of the game the editor is running from. Locate the [GameAssetDatabase] section in the .ini file. If it doesn't exist yet, then go ahead and create this section. Set BranchName appropriately for your game's depot path. You can use whatever name for your branch you think is appropriate, but you must use only alpha-numeric characters. Try to keep the branch name somewhat short as it will be attached to every single journal entry. Note that this isn't really supposed to be a security system -- it just helps to prevent people from accidentally destroying data. Important: The branch name must be set appropriately in all source control branches of your game, otherwise asset and tag data will collide between branches (which can be really, really bad.) If you branch your game and have artists/LDs working in either branch, it's critical to update the BranchName in the new branch. When the Content Browser needs to display a thumbnail for an asset that isn't currently loaded, it will check the asset's package to see if it has a thumbnail and quickly loads then displays it. This happens without actually loading the asset's package or any of it's data. Thumbnails are generated automatically for most asset types by UnrealEd. You simply need load and save the package and the editor will make sure that thumbnails are rendered for all of the supported asset types. If you're seeing a lot of assets in the Content Browser missing thumbnails, it probably means that the packages need to be resaved in UnrealEd. Note that there are many asset types that don't support custom thumbnails yet (e.g. Sounds, CameraAnims, etc.) Also note that you must save the packages in the editor to update the thumbnails. Commandlets (such as ResavePackages) are unable to generate thumbnails as a renderer is required for this. All thumbnails are cached in memory for a short while to improve performance, but most are evicted quickly to keep memory usage light. It's possible to run the Content Browser in "Offline Mode", where no SQL connection is required but you can still make use of tagging and collections. Now, the editor won't bother trying to connect to a SQL database at startup. Instead it will create a journal file on disk where your tagging and collection actions will be stored. When working with tags and collections from a different PC, you'll need to make sure that your user name matches up. For example if you're working from home through a VPN connection and want to interact with your private collections that you created at work, you'll need to set the "override user name" in your preferences file. Note that in Offline Mode, you won't be able to share your tags or collections with other users. However, if you eventually disable Offline Mode after a SQL database is available, the editor will automatically upload your accumulated tagging changes. The first time the Editor is run, the date field "UserJournalUpdateAlarm" is added to UTEditorUserSettings.ini and set to 7 days in the future. This represents the next time the alarm will go off (Note - this is saved when the app closes). Set the time for this entry to a date prior to your next execution time to ensure the alarm will go off. "Check Now" will run the check point updating process, make a back up of the journal file, delete the original journal file, and set the alarm to 7 days in the future. "Next Run" does nothing as the alarm time is properly set to go off for the next run. "Wait a Day" and "Wait a Week" set the alarm time forward the expected amount of time from the current time. This can be enabled for Online builds by setting "[GameAssetDatabase]OfflineMode" to TRUE in UTEditor.ini and ensuring that "[GameAssetDatabase]UseJournalUpdateAlarm" is TRUE (it's the default). This should only be used for testing, as Epic and licensees should be using a content server. Similarly, setting "[GameAssetDatabase]UseJournalUpdateAlarm" to FALSE will disable the Asset Database Maintenance feature. -NoDeletes tells the commandlet not to delete any expired journal entries from the SQL server. Any entries that are older than the built-in threshold will be left in the database. Note that if you always use this option your SQL database will grow very large and your editor startup performance will diminish. The next time you run the checkpoint process without this argument it will go and the delete expired assets as per usual. -ImportOldTags (Removed in May 2009 QA Build, changelist 33172) Imports legacy Content Tag data from all packages and merges that into the game asset database. See the section below on importing legacy content tags for more information. -PurgeGhosts forces the commandlet to immediately expire (delete) any Ghost asset entries from the database. Normally ghost assets are automatically expired after a fixed number of days, unless the asset materializes in a package before then. -Repair will attempt to repair any errors in the database. Note that for errors, a repair constitutes eradicating the problematic entry from the database. -Reset will build a fresh checkpoint file from scratch. It will ignore all of the existing tags, collections, journal server data and meta data and wipe the slate clean. You probably shouldn't use this unless you know what you're doing. -Verify will only check the state of the database and report warnings. It won't actually change anything or save state. Be careful not to resave any content packages using the May 09 QA build (changelist 333172) or later yet! Resaving packages will destroy your content tags. Either sync to the April 09 QA build, or sync the May 09 QA build except changelist 333172. Now you can sync up to a later QA build (all changelists) and you're good to go! From time to time you may see an asset in the Content Browser visually marked as Unverified. This just means that the asset's information was downloaded from the journal server and has not yet been "blessed" by the checkpoint commandlet yet. Assuming the asset was found by the checkpoint commandlet, the next time a user syncs to the latest checkpoint file, the assets will no longer be marked as unverified. If, however, the asset wasn't found (because perhaps a user hasn't checked in a newly-created asset yet, or maybe never even saved it at all), the checkpoint tool will mark the asset as a Ghost. Ghost assets don't exist on disk so are never displayed in the Content Browser, so most users will never even know about this feature. Asset ghosts are still kept around in the database for a fixed number of days in case a user does end up checking in the asset. This is important because the asset may already have tags or other metadata assigned to it, even though it hasn't been submitted to source control yet. Eventually the ghost will expire and be deleted from the database. If you never want to see other user's Unverified assets in the editor you can use the -NoLiveTags command-line parameter which tells the editor to only download information about assets that you created.